Finally got to witness Jeff Nichols’ new opus on its opening night after receiving some prime recognition from Sundance. Take Shelter was Jeff Nichols’ critically hailed film from 2011 that I admired, but didn’t love. It’s a different case with Mud part of me doesn’t want to love it, but I kind of do. Free from jerky twists and cliffahngers the film keeps you intrigued owed greatly to the well acted and well written characters. 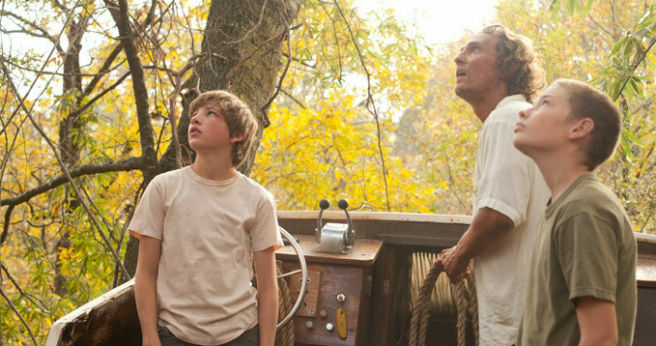 McConaughey is fantastic, but Tye Sheridan and Jacob Lofland steal the show as the two boys who stumble upon a mysterious man wanted for murder. At its core, Mud asks the questions the saying “It’s better to have loved and lost than to have never loved at all” with our lead character Ellis (Sheridan) in muck of his parents relationship collapsing, and starting a relationship of his own with an older high schooler. Mud also questions the unnatural chemistry between males and females and a females ability to manipulate a male. Not like Oscar nominee In the Bedroom, Mud is makes statements about love and loss from a male perspective. McConaughey plays a a man wanted for murder who is waiting for the girl he loves played by Reese Witherspoon. After he encounters the two kids he asks them to help him with several tasks. The dynamic and witty script allows the audience to connect and believe the relationships between these characters. Even the minor characters here find personal redemption for their underlying conflicts. Unlike Take Shelter this film doesn’t have a twist, or much of one, you still constantly question Mud’s motives, but the film doesn’t feel the need to hide from a non-ambiguous happily-ever-after ending. Mud has a lot to say about love, but it works best as a coming-of-age story for the main protagonist Ellis. Sheridan and Lofland have a strong dynamic here and they are consistently entertaining. This is the first film I can say that I loved from 2013, it is not free from flaws with its overbearing run-time and unnecessary reflective symbolism. But it is still great, a fine film.